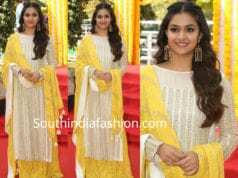 Indo Western Keerthy Suresh’s Indo-Western Look! 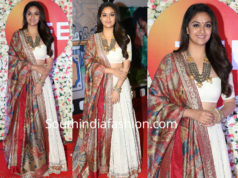 Keerthy Suresh attended an event recently wearing a blush pink embroidered crop top with pleated palazzos and cape by Behind The Seams. Subtle makeup and earrings from Prade Jewels completed her look!